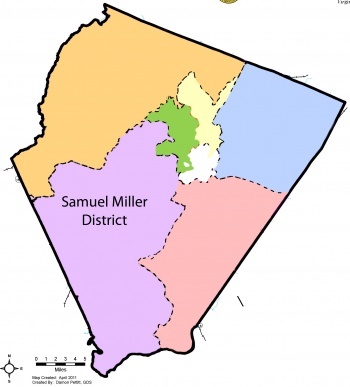 The Samuel Miller Magisterial District is one of six magisterial districts in Albemarle County. It is named for Samuel Miller, the 19th-century philanthropist. The district is in southwestern Albemarle, between the Scottsville Magisterial District to the south, and the White Hall Magisterial District to the north. The district includes the communities of Ivy, North Garden, and Covesville. Liz Palmer is the current supervisor representing the Samuel Miller District. Karen Firehock is the current planning commissioner. Graham Paige is the school board representative. Palmer will run for reelection to the Board of Supervisors in the 2017 election . ↑ Web. , Sean Tubbs, Charlottesville Tomorrow, March 29, 2017, retrieved April 2, 2017.